1. Bedroom 1 (Master) - King size bed, En-Suite bath/shower room, 26in TV, Hair dryer, Walk in wardrobe, patio doors leading to pool area. 2. Bedroom 2 (Master also) - King size bed, En-Suite bath/shower room, 22in TV, Hair dryer and Walk in wardrobe. 3. Bedroom 3 & 4 - Both have Twin beds with walk in wardrobes. Shared 3rd Family Bath/Shower room. 1 Room has 14in TV. 4. The bedroom layout makes it ideal for 2 families or for having the grandparents along. 5. The Lounge area is spacious with a 42in Flat Sceen TV, Home Cinema system/DVD/Stereo and patio doors leading to pool area. 6. The fully fitted kitchen has everything you could need should you wish to eat in. The utility room with seperate washing machine and dryer, ironing board and iron. 7. 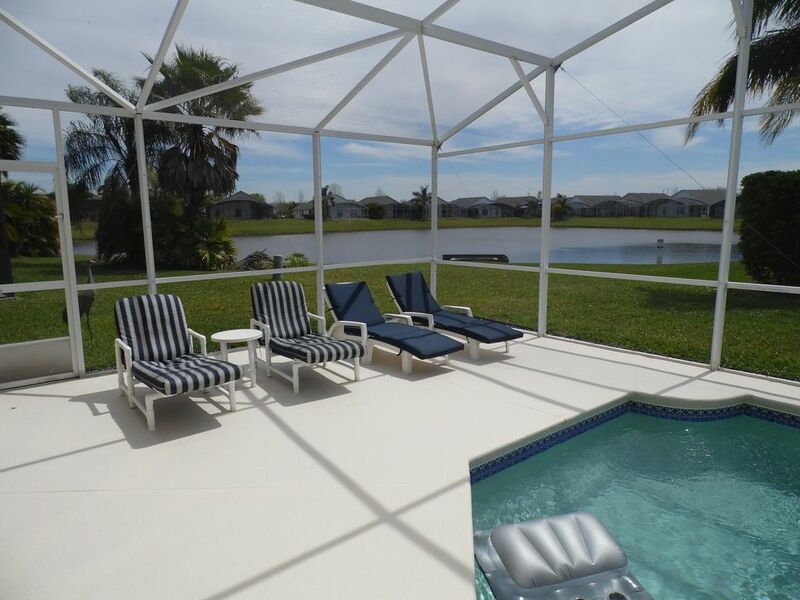 It has its own south facing screened pool (24ft x 13ft) with extended deck area for those relaxing days sunbathing or a quiet drink in the evening after a long day at the parks! The pool can be heated for a small additional charge. And don't forget the lovely lake view, watching for wildlife. 8. The villa has free internet access available, ethernet cable or wireless plus free calls to within USA and Canada. 9. The villa is on the quiet development of Eagle Pointe. This is just off the main 192, so if you don't fancy eating in then you wont have far to go to find an excellent selection of restaurants. This, together with the fact you are only 10 mins from the gates of Disney and 5 mins from Walmart, makes it an ideal location. 10. A local Management company maintain our property and assist our guests during their stay. We live in the UK but love our vacations in Florida and visit at least twice a year. We love the weather and the fact that we can combine the relaxation around the villa and pool with the excitement of the Theme parks. It's close to all the main attractions yet on a quiet development that lets us get away from it all as well. The property has an ideal layout for 2 families travelling together or a family with grandparents. We love having breakfast by the pool looking out over the lake at the rear and sitting in an evening watching the sun go down. It's close to the excitement but allows you to get some relaxation if needed. We think it's an ideal location. The Villa is South facing and backs onto a Lake. Villa is fully air conditioned with ceiling fans in main living area and both master bedrooms. Villa contains all linen and towels with changes available. No Beach Towels provided. Leather 3 seater, 2 seater and chair. 42' Flat screen TV, home cinema system. Fully fitted kitchen with all utensils provided. Heated Pool, Pool heating available at $125 per week, No Smoking and No pets Please! Highly recommend this home for vacation. Loved the spacious layout, pool, screened area. It was a great stay. Superb lake view property ideal for 2 families close to theme parks and restaurants. We had a great stay at this villa, everything was as expected and wee extra things too like pool inflatables, a couple washing tablets etc. Would definitely recommend! Had a great vacation due to this home away from home. Perfect location for our needs. Had such a great time we are now looking to do this type of vacation yearly. We tried to book this location before we leave and it was already booked. Not surprised. Many thanks for your lovely review and we are so glad you enjoyed your vacation and the villa. We have quite a few regular guests who come back each year or every couple of years and all seem to say the same regards the location being ideal for their needs. Sorry your dates weren't available for your next visit but should you decide to book again we do try and offer a discount to returning guests, dependent on the time of year. Eagle, kite, heron, turtle, deer, racoon, possum, stork, fish and duck all seen in and around the villa. The villa itself was spacious, clean and all the amenities required for our stay. Central to all theme parks, shopping and eating out on the US192 or wherever we decided to go. One special thanks to the pool cleaner, after one extremely heavy thunder storm he called into the villa and explained in detail what he was doing and why. He then cleaned the pool and called again in the next two days to update us and check the water quality. We also had a minor issue with a latch on a door, one phone call and it was sorted within hours, the management of this villa is excellent. No problem recommending this villa for visitors. Within easy reach of all main theme parks, 10 mins to Gates of Disney, 20 mins to Sea World and 30 mins to Universal Studios. The villa is just a couple of minutes off the popular 192 with all its restaraunts and shops and is only 5 minutes from Old Town and Medieval Times. Cleaning Fee of $90 is charged for stays of less than 5 nights. Pool Heating is available at $120 per week. Gas BBQ available at $45 per week. Please email to confirm prices as we maybe able to discount the rates shown.